Shadow Cliffs Regional Recreation Area can draw more than 50,000 people during the hot, dry summer months in the East Bay suburb of Pleasanton. A former quarry site, the park’s lake sparkles under the summer sun. That spring-fed, 80-acre lake has long been a draw to beachgoers, grillers and anglers. 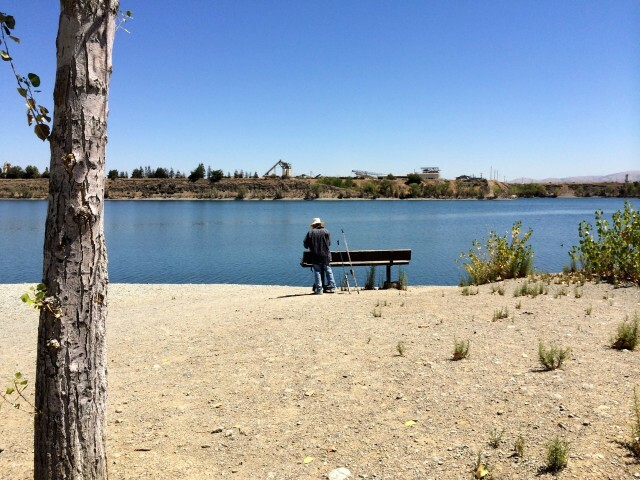 But three years into California’s historic drought, that lake has shrunk to about 75 acres, according to park supervisor Bill Kaminski. To keep up with the receding lake, Shadow Cliffs’ swim area keeps getting pushed farther and farther out. 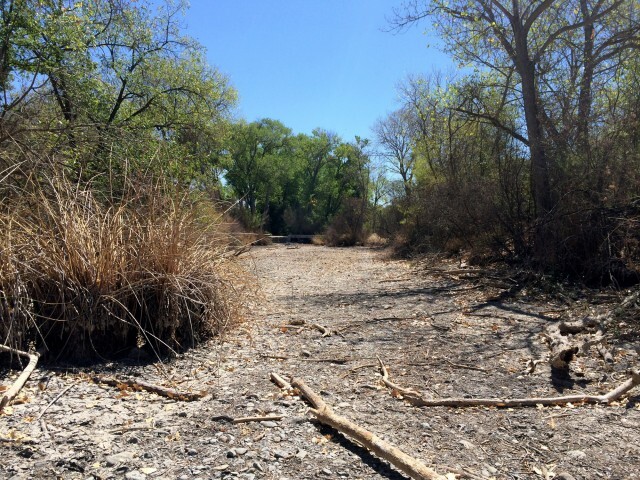 A creek here has gone dry, stranding fish. And the park’s pumps are now above the lake’s water, unable to provide water for trees or lawns. Instead, the park fills up a truck from a fire hydrant, and waters the trees in hopes of keeping them alive. Many are losing leaves, visibly struggling. Shadow Cliffs has seen the most severe effects of the drought of any park in the East Bay Regional Park District. Hadley tries to swim every day. But for six days in July, no one could swim at Shadow Cliffs. “It’s never been closed for the length of time that it was closed this year,” she says. The East Bay Regional Park District had to shut down the swimming areas due to high levels of E. coli. Park supervisor Bill Kaminski says that warm weather and swimmers kicking up bacteria in the newly extended swim areas contributed to the high readings. Another source of that E. coli sits on the shore, just a few feet from the water: a gaggle of Canadian geese, and their waste. 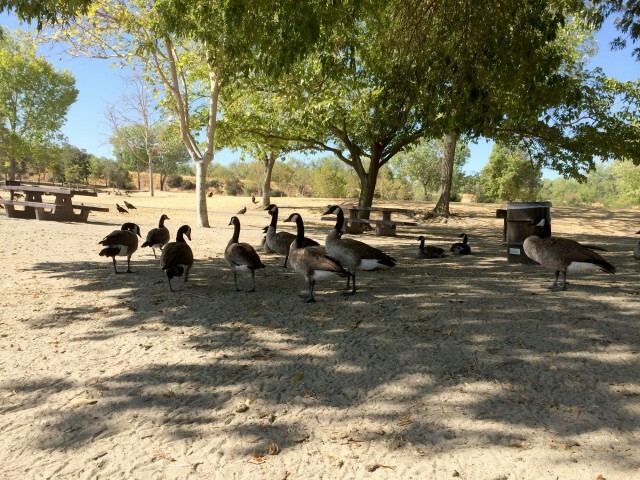 Shadow Cliffs’ geese didn’t always hang out at the beach. They began once the park stopped watering grassy areas. Around 11 a.m. on a recent Friday, the weather was starting to heat up. Hargrove says his stand gets well over 100 degrees on hot days -- too hot to stock ice cream treats. So he sits out front on a table, keeping an eye on the boats. Business has taken a hit at the stand. Hargrove estimates it’s down about 40 percent. 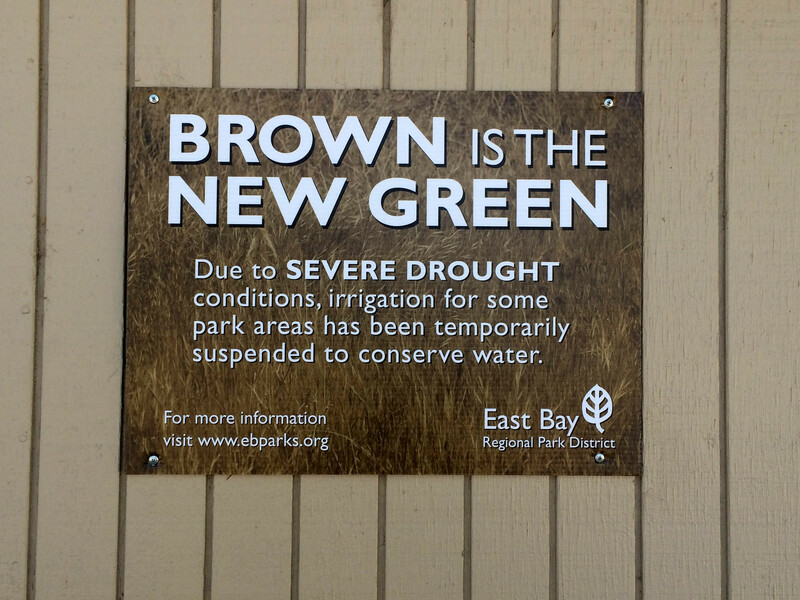 Other parks around the state also have felt the impacts of the drought. The state’s Department of Parks and Recreation shut down camping at Portola Redwoods Park, citing a lack of drinking water. The Hearst Castle Visitor Center closed its bathrooms, and a leaky pool at the castle was allowed to drain. At Shadow Cliffs, after Hargrove’s shift ends in the early afternoon, Kaminski hops in a pickup to demonstrate the effects of the drought on this 265-acre park. He pulls up in front of the lake, just past Hargrove’s stand. It’s down more than 10 feet, he says, gesturing at the shimmering blue water. That puts the lake here at or past its all-time low. “All our boat docks and piers are basically resting on mud right now. Where they’d normally be in about 8-to-10 feet of water,” Kaminski says. And the lake continues to lose half an inch of water -- or more -- every day. But the park’s problems don’t end with the lake. Trees are shedding their leaves early. Attendance was down sharply in July and August. And anglers say that it’s tough to catch fish. On the other side of the park from the lake, a creek is going dry: bad news for bass and bluegills. “They just get stuck in pools and don’t realize that those pools are evaporating,” Kaminski says. But the park isn’t in crisis mode. Not yet. At this point, Kaminski says, there’s little he can do but wait and hope for rain. If the state gets a wet winter, things could get back to normal at Shadow Cliffs. But as Kaminski pulls his truck up in front of his office, he says it’s been a frustrating summer. Kaminski says the park will stay open, and that the lake here is still beautiful. It’s just not the lake that people are used to. Thanks for signing up to the newsletter.